There’s no question autonomous vehicle technology was a prominent theme at CES 2018 in Las Vegas. Between partnership announcements by major auto manufacturers and driverless technology makers, Toyota introducing a driverless vehicle for autonomous business applications, AAA working on unified safety criteria for driverless vehicles and even autonomous taxis shuttling attendees up and down the Strip, this year’s CES cemented the fact that the age of driverless vehicles is upon us. Here’s a look at some of the biggest announcements. One of the more interesting innovations in the autonomous vehicle space introduced at CES was Toyota’s e-Palette. Part shuttle, part mobility platform, it can be adapted for a wide range of mobile business applications, including everything from restaurants and food delivery, stores and hotels or even hospitals. The all-electric, driverless e-Palette was previewed at CES, with its official debut slated for the 2020 Olympics and Paralympics games. Toyota has already formed an e-Palette Alliance, with early partners including Amazon, Uber, Pizza Hut and Mazda. Chipmaker Nvidia seems intent on making its mark on the autonomous vehicles landscape, announcing a cross-continental partnership with Uber, Volkswagen and Baidu to use its chips and technology to power the artificial intelligence behind existing and planned fleets of self-driving cars. Uber has been looking into self-driving technology possibilities since 2015, and will use Nvidia chips as the brains behind its self-driving vehicle fleet, both companies announced at CES this week, according to CNBC. The Volvo XC90 SUV’s Uber used in early testing was powered by Nvidia’s graphics computing technology, which it also uses for its existing self-driving freight trucks and cars. The Volkswagen partnership will implement Nvidia’s Drive IX platform, which includes features like facial recognition, gesture controls and even a voice assistant. Volkswagen says it plans on using the software as an “intelligent co-pilot” to assist drivers. Nvidia will also collaborate with Baidu — essentially the Google of China — to design production-ready, AI-based driverless vehicle systems based on Nvidia’s Drive Xavier platform in the large Asian country. 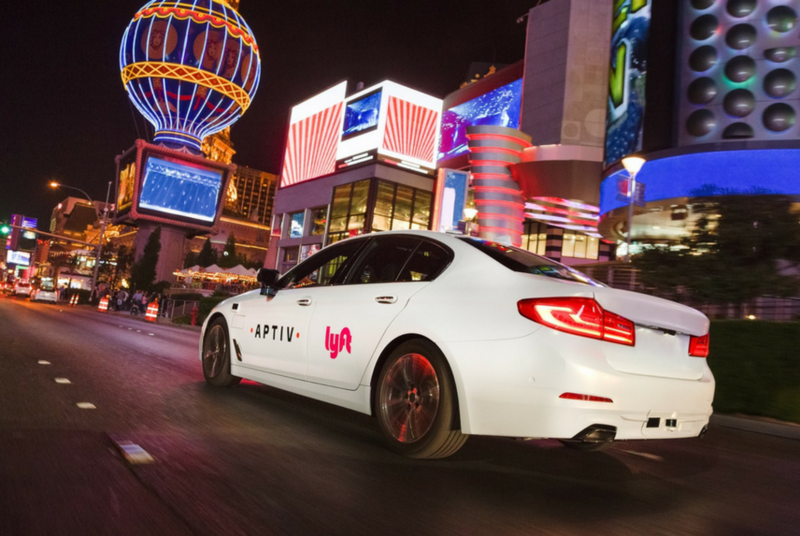 Using software provided by Lyft, technology company Aptiv kitted out a fleet of BMW 5-series sedans with self-driving capabilities, including Lidar, to use as taxis for people attending CES. The cars could be hailed with a smartphone app, and once inside, the passenger could choose from a list of pre-selected destinations using a tablet. The event made for a real-world beta test for the technology, which the company says will be ready for commercial use by 2019. But CES wasn’t just a flashy demo. Aptiv representatives told Automotive News they plan to keep the fleet active in Las Vegas even after the event concludes, adding Sin City to its roster of locations where its auto-taxis operate, which currently includes Boston and Singapore. Currently, the number of autonomous taxis operated globally by Aptiv stands at 60, but Automotive News reports it has plans to expand that number to 150 by the end of 2018. The American Automobile Association (AAA) announced at CES a partnership with self-driving technology company Torc Robotics to develop a series of safety guidelines for self-driving cars that can be followed industry-wide. The goal is to establish a unified set of standards that automakers can use to ensure consumer safety and public trust in the technology as it continues to gain momentum, even as 75% of Americans say they’re skeptical of self-driving cars, according to Engadget. AAA will test self-driving cars on public roads to gather data that it can use to create the criteria, which can then be applied to every company working on driverless vehicle technology. It’s an attempt by the association that has long championed driver safety to move into the 21st century and transform its business model with the changing automobile landscape.